"If you like traditional fried zucchini, and you're like me, when you get done frying it you only have half of what you fried left. This is a simple and quick way to fry enough for everyone." Place zucchini and onions in a medium bowl and mix together. In a small bowl mix flour, cornmeal, salt, pepper and garlic powder. Pour dry mixture over zucchini/onion mixture, cover bowl and shake well. Let mixture sit for about 30 minutes; a batter will form on the vegetables. In a medium skillet heat oil over medium heat. When oil is hot add breaded vegetables and fry, turning to brown evenly. 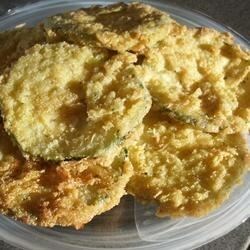 A re-imagined version of fried green tomatoes using zucchini. This is an excellent recipie. Even my son who does'nt like zuchinni said so. I did increase the salt in it. Also I used one zuchinni and one yellow squash. Easy, fast and delicious. Thanks. My family loves this recipe. The zucchini turns out nice and crispy. I did eggplant too and it was wonderful.